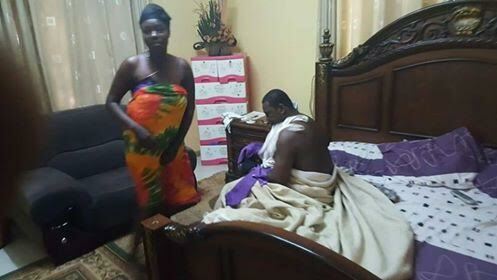 Apostle Douglas Akwesi Amanor ( pictured on the bed) was caught naked with Mrs Mina Adjei ( pictured ) a married woman and a member of his church on her matrimonial bed in Accra , Ghana. “ Wonders, they say , will never end indeed . Head pastor and founder of the Apostolic Good News Church International- Apostle Doglas Akwesi Amanoris been caught naked and pants down with Mrs .
Mina Adjei, a married woman and a member of his church right on her materimonial bed at her EMEFS Estate residence at Lashiebi in Accra . Mrs Mina Adjei, is the wedded wife of Mr Thomas Adjei- a Managing Director of an advertising company in Osu - Accra . The couple are married for nine good years and blessed with two wonderful kids- a girl and a boy . Speaking to the victimised husband upon a tip off by our newsfeed, Mr Thomas Adjei, totally broken down in spirit and soul narrated his tragic experience to your Authoritative New Crusading guide news team who followed up on the story . My wife and I have been having some marital problems for sometime now base on her recent attachments and relationship with other men , and over her constant nagging and reluctancy to pick the kids from school and take care of them in her shop ,which is even closer to the school . She had never accepted her fault or explained to me peacefully even when caught redhanded with men in very uncompromising situations at odd times . Due to this , families and counselors advised that we seperated for a while due to her violent attitude whenever there is a little problem while the two families put heads together to resolve the issues . On that fateful morning of Saturday May 7 , 2016 , at about 6 : 30 am, I had left my hideout to the house to go and pack my belongings from the house , since my wife and I had earlier agreed that our EMEFS Estate rent had expire, and due to some hintches in business for now , we shall rather relocate into a much affordable appartment instead of renewing the rent again ” he narrated . But he said , the woman said she would not agree to their earlier agreement , but instead claimed she has an uncle who says he would continue with the rent for her to stay in the EMEFS apartment all by herself . He continued that , he went with a carpenter to help him fix and change some of the locks where necessary before he finally packs out since the woman says she may be staying in the house with her so -called uncle of a benefactor , till the families resolve the issues . He said , upon reaching the house , they started knocking at the main gate for sometime before a sister in law came out to get the door . I greeted and entered the house as the man of the house and walked straight to our master -bedroom to knock on our bedroom door . But as I knocked for long minutes without any response at all , I then decided to push the door to see what was wrong with my wife in there, because her sister had already confirmed that she was inside . As soon as I pushed the door opened, my wife rushed out to push it back against me! Wow, what is happening here? I wondered at her attitude. This gave me the idea to suspect that something crazy was definitely going on in the room . because of my past suspicious of her, with other men in her car, so I decided to force the door to open by force, I forced the door back on her , and lol and behold , here was a thick tall dark man naked on my own matrimonial bed with my wife in my room ! How else could a man be traumatized in his life than this ,he lamented . Describing his woes to the team , Mr Adjei, underscored that , at the instance , his heart was terrified so much so that he could not move nor scream , so all he found himself doing was to start clapping his hands for them . He said , after some seconds, he gathered some courage and decided to take some pictures for evidence . But to my amazement , my shameless wife suddenly pounced on me in an attack and tore my clothes to prevent me from taking the pictures , but when she realized that she can not stop me, she ran to her so called daddy of a pastor and stared covering his face with the man ’s underwear shouting, Daddy don't allow him to take our face , he elaborated . Mr . Adjei, who said he gathered all the courage not to be violent in the act continued that he left the scene quietly when he realized the wife was trying to be violent to cover up her shame and went back to his hideout to avoid any false accusations of assault . He said , he managed to go to his own church the next day - Sunday May 8 , and then reported the case to the Larshibi Vivian Farm police who later arrested the two who were granted bail the next day . According to Mr Adjei however , had been the fact that , the wife is rather shamelessly going round tarnishing his image and rather painting him so black to the world without any shame. Every effort made by our team to contact the two accused persons ( the wife and the pastor ) for their sides of the story had proven futile, since all their known lines have been switched off . The only available contact of Mrs . Adjei had also rang countlessly without any response . Meanwhile , the police has given a confirmation of the case been reported to the Vivian Farm station at Larshibi, but says the case is under investigation and so they would want to hold on to their commits and further details for now .